Are you over Castle‘s cancellation? Recently, star Nathan Fillion spoke with the New York Post about the end of the long-running ABC series. Fillion played mystery novelist Richard Castle on the drama for eight seasons until the network cancelled the show earlier this year. The cast also included Stana Katic, Tamala Jones, Seamus Dever, and Jon Huertas. What do you think? 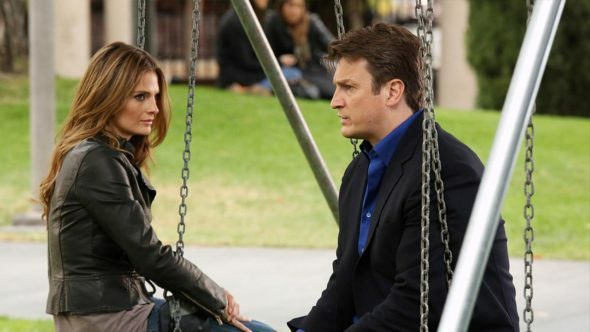 Are you a fan of Castle? Are you still sad the show is over? Castle: Are You Glad the ABC Series Was Cancelled? I loved this show! So few that I like and appreciate. I wish the network would bring it back!! This made me so sad! I adored this show and all the characters. Networks really know how to hurt a person!! I miss this show. No no no no…bring it back!…so irritated….why#!!! Oh no! Castle cancelled?! This was one of my most favorite shows. The cast meshed so well together. This news make me very sad. I wish the team well. I’ve enjoyed you all very much. I am sorely disappointed that Castle was cancelled. It was among my favorite shows on TV. The show was both interesting and adventure seeking.